I like to think of myself as pretty tech savvy. However, I’ll admit it, like many of you with the explosion of tech itself and multiple social media platforms, it can be hard to keep up. So here I stand raising my hand admitting that Facebook confuses me. I consult with clients about social media and video integration on a regular basis. I should know and understand all aspects of sharing, embedding Facebook videos on your blog and optimization. I do not. Yet, the great thing about the internet these days is that by searching the right terms, you can find a solution to your problems in short order. Now that I’ve come clean on my shortcomings allow me to get into why I composed this blog post in the first place. Until recently, I had never once thought to do this. I mean, there’s already YouTube and Vimeo, which are ubiquitous in the realm of embedding videos onto blog posts. However, ask anyone with a Facebook business page if they would like a way to receive more organic traffic to their page and the answer will be a resounding, “YES”. 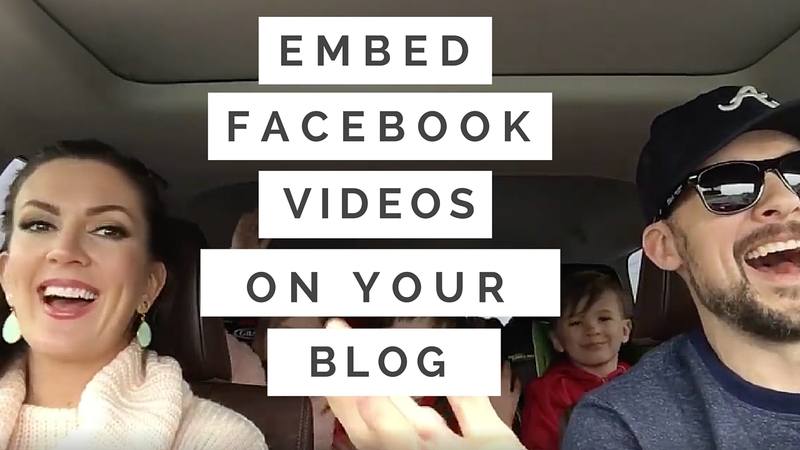 Embedding Facebook Video Is Easy (But It Is Hidden). Facebook has gone all in on video. In fact, I challenge you to open up you app and not watch a video. You can’t do it. Mark Zuckerberg is smart (understatement of the year) and he and his programmers have set up Facebook to auto-play videos. This helps grab the attention for casual viewers like you and me. But once the lifespan of your Facebook video has reached its limit, why not repurpose your content on your own blog? That is what I am doing for the video at the top of this post. So here’s how you do it. Go to your Facebook page and locate the video you would like to add to your blog post. Then look closely for the date and time of when your video was posted. This is why I referred to this action as “hidden”. After you click on the date, the video file will open up further and you will look toward the bottom of the screen where you’ll see a button that says, “options”. (Sorry about the fingers in the nose part, but its just kids being kids). There, a drop down screen will appear and you can either select “Embed Video” or “Embed Post”. The only difference between the two options will be whether or not your video description will be included in the video or not. It’s completely personal preference and I could see an argument for either one. Lastly, a new box will appear and from there you’ll be able to grab the embed code, copy it and then paste it into your html section of your blog composition. Check to make sure that the video appears by utilizing the blog preview tab and it should be good to go. I used the term repurpose earlier in this post. As content producers, we have a lot to keep up with. A blog post requires you to jump on Twitter and link to it, then a beautiful picture with an interesting caption for Instagram, a share on Facebook and perhaps you’re even Snapchatting what your writing as you’re writing it. That’s a lot of work and there’s no need to limit yourself to get your content out to the masses. This is just another way to increase your breadth and depth of your brand and maybe, just maybe even receive a few new Facebook Likes to your page without having to pay for ads. My wife, Jennifer and our three kids just wrapped up a 1,700 mile spring break road trip from our home in Athens, Georgia to New York City. Along the way, we stopped off in Washington D.C. and Philadelphia. We had just left out of Washington D.C. and were driving to Philly when Jennifer pulled out her bundle of old college compact discs. Most were scratched, many were completely inappropriate to play for our kids (Notorious B.I.G., Everlast, Dr. Dre) and some just did not need to ever be played again (Creed). However, the Backstreet Boys “Millennium” CD was intact and we popped it in. The video itself was not really planned out, I had been recording the kids goofing off with my iPhone propped up on my dashboard. But once the catchy pop tones of Nick, Kevin, Howie, Brian and AJ started playing, Jennifer and I only did what comes naturally to 30 something year old parents. We sang along.